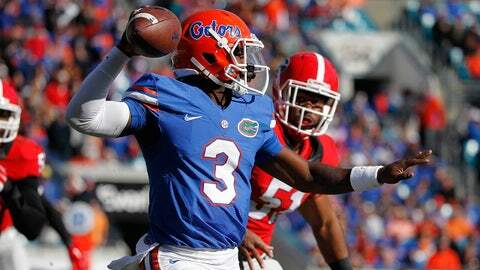 Treon Harris led the Florida Gators past the Georgia Bulldogs 38–20 last season. GAINESVILLE, Fla. — With a week off to process the progress of his football program to date, Florida coach Jim McElwain took a good look at his team’s last game — the 35-28 loss at LSU — and saw some things that stuck out. Things he did not see so much during the first six weeks (and six wins) of the 2015 season. He saw guys pressing. He thought the Gators looked "out of sorts" on ocassion and did some uncharacteristic things. They may even have tried to do too much at times. That’s not, McElwain said Monday, how this team is going to win. Yet, here they are. Florida-Georgia week. High stakes. The way it’s supposed to be. "We’ve put ourselves in a position to where what we do is relevant," McElwain said in advance of his first taste of the UF-UGA rivalry. "That’s kind of a neat thing, but it doesn’t mean anything if we don’t take care of what we need to do today to get ready for Saturday. With this team it’s always fun to see. There’s great teachable moments that come out of everything we do and not just from out on the football field. I look forward to seeing them [at practice]." By virtue of some crazy outcomes during their open date, the No. 11-ranked Gators (6-1, 4-1) climbed two spots in the AP Top 25 and face the Bulldogs (5-2, 3-2) with much on the line Saturday at EverBank Field in Jacksonville. The down-the-road ramifications aren’t set in stone, but they’re pretty much in the cement mixer and ready to poured. Both teams control their destiny in the race for the league’s East Division title and accompanying berth in the Southeastern Conference Championship Game. "It feels great," senior offensive lineman Trip Thurman said. "If we do what we’re supposed to do we have a pretty good shot." At everything. Undefeated and one-loss SEC teams can dare to dream big. If the Gators win, they’d have to beat Vanderbilt (3-4, 1-3) at home Nov. 7 and South Carolina (3-4, 1-4) on the road Nov. 14 to assure themselves of their first trip to Atlanta since 2009. And that’s assuming the Bulldogs don’t slip up along the way. Georgia, even with a victory Saturday, would still have to win at home against Kentucky (4-3, 2-3) and at Auburn (4-3, 1-3) to clinch the division. The 93rd meeting of one of the SEC’s longest-running rivalries will pit the the Bulldogs and the league’s No. 5 offense (429.4 yards per game) and No. 2 rushing attack (215.5 per game) against the Gators’ No. 4 defense (314.4 yards per game). In SEC play, the UF offense rates next to last (331.0 ypg), compared to UGA’s No. 6 unit (344.0). Statistically speaking, however, those current numbers — particularly on offense — probably don’t accurately reflect the current state of either team. The Gators amassed theirs mostly with Will Grier, suspended for the rest of the season, at quarterback, while the Bulldogs got theirs with All-America candidate Nick Chubb (season-ending knee injury) at tailback. Now Treon Harris (61 percent, 540 yards, 4 TDs, no interceptions) is quarterbacking Florida and Sony Michel (520 yards, 5 TDs) and Keith Marshall (179 yards, 3 TDs) are tag-teamming the Georgia running game. They’ll be much of the focus Saturday. What matters more: If UF and UGA finish in a tie for the East, Saturday’s winner holds the tiebreaker advantage. "We all know what’s at stake," sophomore slotback Brandon Powell said. "We take it as another game and try not to get ahead of ourselves." With those words, Powell was channeling his best McElwain, who talks (and talks some more) about dealing "in the now." As in doing everything today, tomorrow, etc., to be prepared for the next game. "I don’t think there’s a need to give all these what-ifs and all that kind of stuff, only because if you don’t do what you’re supposed to do, then you’re not going to be talking about it anyway," McElwain reiterated. "Like I said, I’m excited to get them together [at practice] and see where they’re at and see if we’re willing to throw our chips in the bucket and go all in." UF will regain the services of redshirt freshman tight end C’yontai Lewis (broken hand), out since the second game, as well as safety Marcel Harris (ankle) and defensive tackle Joey Ivie (hernia). The status of placekicker Austin Hardin (hamstring) remains uncertain. Hardin came on when Jorge Powell suffered a season-ending knee injury on a kickoff at LSU and was true on three point-after attempts, but the UF staff staged an open tryout for placekickers during the open date and narrowed a group of 216 candidates to three. That trio was scheduled to be at practice Monday and continue their tryout — wearing pads and in live-action situations — this week. "It was a really good time for a bye," McElwain said. For McElwain, Doug Nussmeier, Geoff Collins and the rest of the Florida staff, the week off meant taking the mistakes — both physical and mental — from Oct. 17 in Baton Rouge and turning them into those teaching moments the head coach referenced that will apply in this home stretch. Not to be discounted, as McElwain pointed out, was that last outing came against a pretty good LSU team — now 7-0 overall and ranked fourth in this week’s Associated Press poll — that needed a fake field goal in the fourth quarter to produce a game-winning score. But that fake kick, plus the continued inability to run the ball, some ill-timed errant throws, blown assignments in pass coverage and missed tackles all fall under the category of "details." And, oh, does McElwain talk about the details. Being on the details got Florida its 6-0 start. Getting back on them will further the quest for a division title, which was the Gators’ goal going into the season. "We certainly didn’t start this journey to not be in this position," McElwain said. "Maybe on Wednesday I’ll have a better idea based on Monday, Tuesday, Wednesday moving forward to see where we are in our preparation. But [Georgia] is a darn good football team now. Year in and year out, they recruit the best players in the country and they’ve got great coaches. This is why you get into it; to play in games like this. If you’re not prepared and you’re scared, then this probably isn’t the place for you because this is the expectation of the University of Florida."